Opening the Community Centre at last! After nearly six years of fund raising, planning and hard work it was time to open the Community Centre and invite all those who had helped make the centre possible to a party. In true CJT style the event was enjoyed by all who attended as were the tours of the Heritage centre. 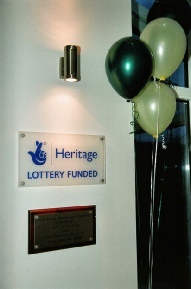 Another plaque is added below the HLF one stating that the Spike Community Centre was opened by Mr Martin Moss and Mrs Patricia Beasley. Pat won the scissors to open the Spike at the Charlotteville Burns Night in 2006, nearly two years before we had a Spike for her to open!